5"hx4.5w acrylic mirror with a 3.5"h Monogram Letter in the center. This topper come in four (4) Fonts. 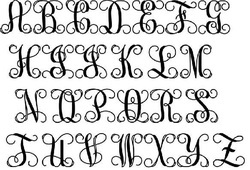 Flourish Script (The letter "C" Fully Dececorated with 3 Crystal Colors) "shown", Victorian Script, Block or Curlz and in Two (2) Acrylic colors Mirror and Black.